I think that it's good to help people. I get to share with my whole family. I think it is amazing for helping other people and people that don't have food. I was bored one day and I had no food at home and I remembered I had food so I filled my stomach and it made me happy. It helps my family. I give it to my mom, my cousins, my sister. They feel good! Feels better. It helps my family. As a teacher, I see the children worry about all sorts of things at home and the last thing anyone should worry about is food. Being apart of the Pack A Sack program has eased my mind because I know that we have helped kids by providing nutritious non- perishable items for the students to bring home, on Fridays, to eat during the weekend when they do not get free and reduced lunch. Nothing is more important than a child's health. The kids love the bags. On Fridays they ask me if they are getting bags today. ​I first met Jen and Johnnie at a support group for local non-profits. Hoping for tips on fundraising and a larger network, I attended for a year. What I gained is a life-long friendship with 2 kind, generous ladies who view the world much the same way as I do. The concept of Kindness Shared, Happiness Squared is genius. Jen and Johnnie search out small non-profits who will benefit from their efforts on a grass roots level. Project Linus is happy to be a recurring annual spring project with the number of blankets being made increasing every year. The joy of their method is that most projects provide a hands-on component that is not check writing. So many people want to help in a quick, simple social way that Jen and Johnnie are actually providing a service to the community over and above the agencies that they are helping. Another aspect of their work is their non-threatening posture. They are happy to organize, schedule and advertise (post) their upcoming plans and everyone is free to participate or not. There is never any pressure to do them all but to pick and choose what appeals to you either because of the cause or the activity. It is my hope that Kindness Shared continues its mission for many years and I plan to be an ever larger part of their goal of spreading Kindness, Happiness and Joy. I can't believe it is already that time of year again! The holidays are quickly approaching. Let me tell you, the both of you are making 24 teenage boys extremely excited to celebrate the holiday with us here at HomeSafe. 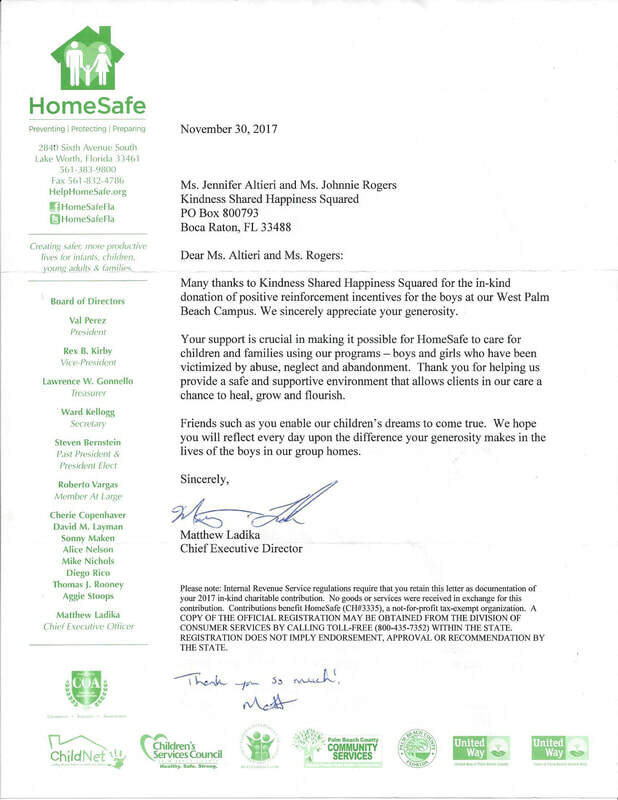 I cannot even begin to tell you how extremely blessed we are to have you both advocating for our boys and making sure they have an amazing holiday; even though they are unable to spend the holidays with their biological families. Thank you for being our Guardian Angels over the holiday season; your kindness is appreciated more than you know. Again, what can I say except thank you to the both of you and your organization. From now until next June, we will be seeing many, many children in crisis. I’m not sure if you’re aware that we cover all schools (elementary, middle, and high schools) from the Broward County Line up to Southern Blvd. and from A1A deep into Wellington. Not to mention the calls of children we see in private homes throughout the year. Please know these teddy bears, monkeys, and pups, make a difference in these children’s lives, therefore you all make a difference. We do explain to the families where these donated “pets” come from, and they are most grateful. Because of your efforts, and the efforts of everyone involved with Kindness Shared, the children are that much better off. Make no mistake, I will keep the both of you, and your organization, in my good thoughts until my thoughts are all that is left. "When we give cheerfully and accept gratefully everyone is blessed." you can do things I cannot; together we can do great things.